September | 2011 | YesBiscuit! This is the most strikingly beautiful puppy I can recall seeing in quite awhile. 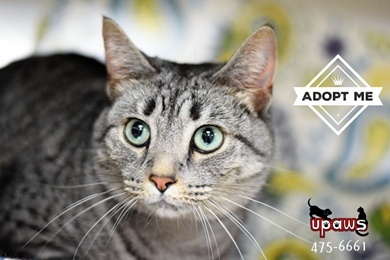 Easy to photograph, easy to adopt. Little pancake on a chokepole. Dragged to the kill room. Incoming dog dragged on a chokepole. The beautiful dog looks so sad as he is taken to the kill room on a chokepole. The city of Smithfield appears to have a small animal control unit operating under the police department with no physical shelter. 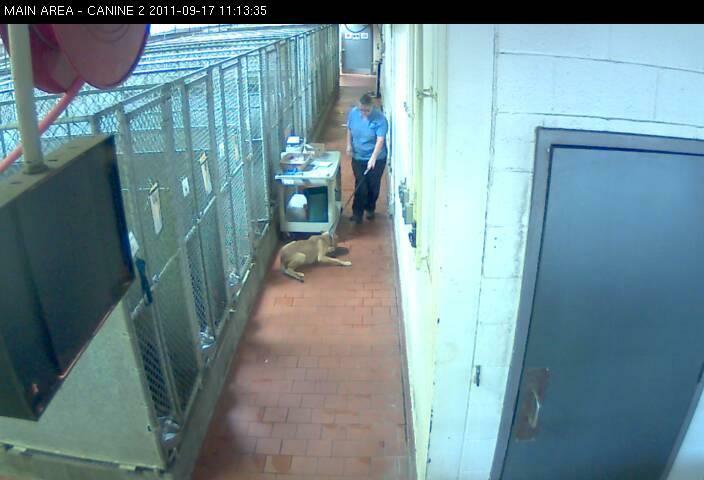 They do have what the Salt Lake Tribune describes as an “unshaded temporary holding kennel” outside where an ACO can place an impounded dog briefly before transporting the pet to an area shelter. Multiple witnesses who observed Mr. Robbins finding Lola’s dead body in the pen on June 27 reported the story to his superiors. Mr. Robbins resigned and this month was charged with one count of animal cruelty and one count of evidence tampering – both misdemeanors. 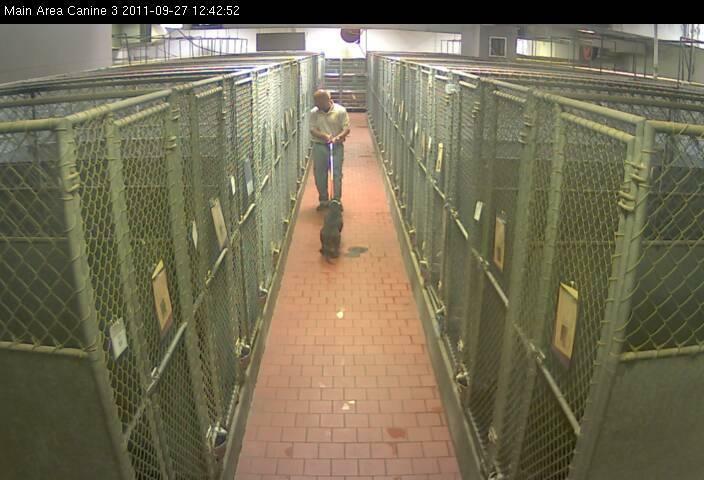 An update on the li’l buttons at the Henry Co shelter: The last 3 were placed with a rescue group last week! This is the story of dog #A232344 who was impounded by Memphis Animal Services (MAS) after someone called in a report of a dog who had been hit by a car. 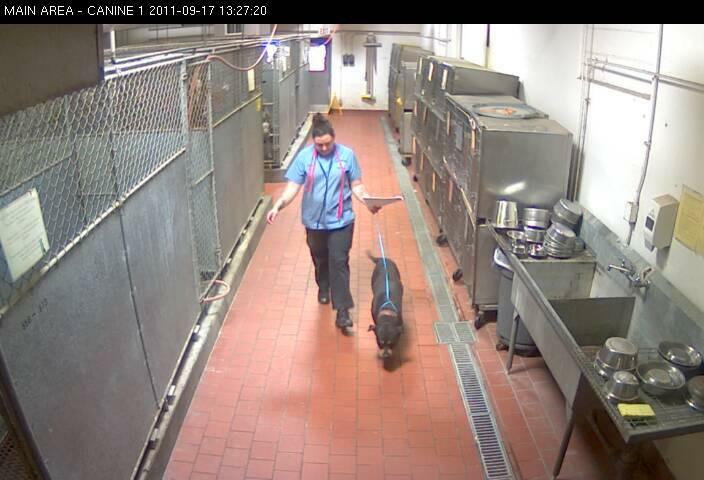 The ACO’s report indicates the dog had the appearance of injury to the hindquarters. Assuming no person found the dog lying in the road and carried him to the flowerbed (which seems an unlikely act to me), we can deduce the dog had some mobility although the extent of that mobility is unknown based upon this report. There was no vet at MAS on a Wednesday afternoon (anyone know why?) so the dog was transported to a local clinic so a vet could evaluate him. 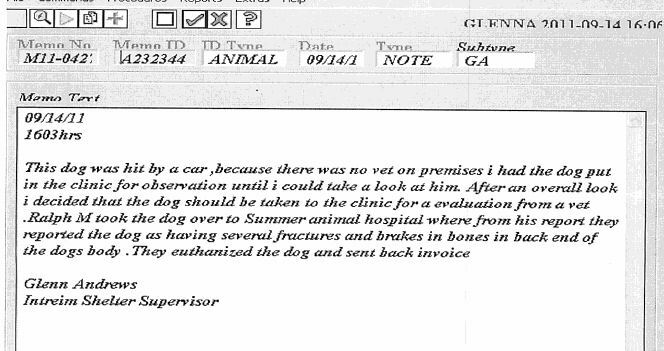 According to Mr. Andrews’ note, the person who took the dog for the veterinary evaluation advised him that the vet clinic “reported the dog as having several fractures and brakes (sic) in bones in back end of the dogs (sic) body” and that the dog was “euthanized” there. 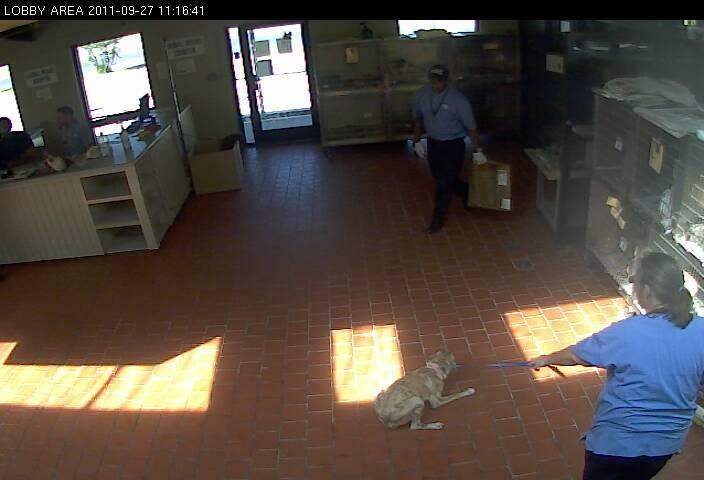 From the photo, it appears as if the dog had at least some mobility. 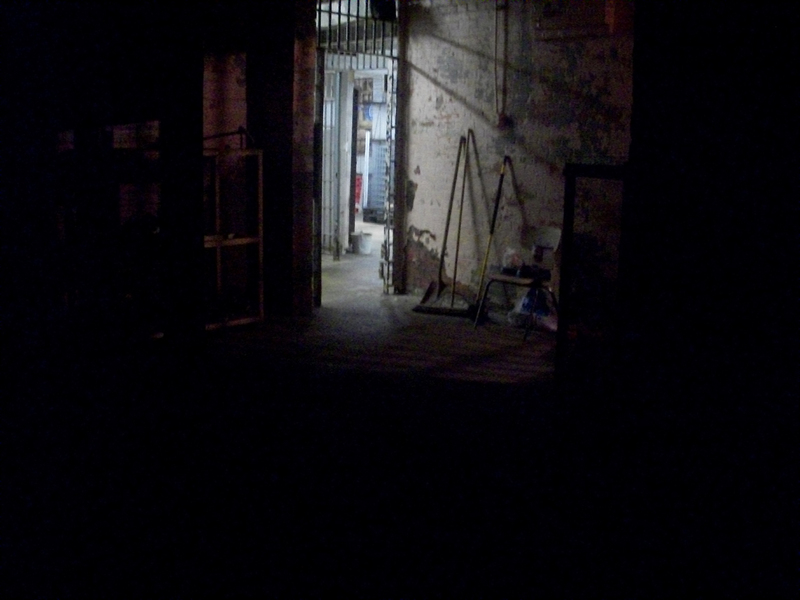 The photo also shows the dog inside a cage on a chokepole. 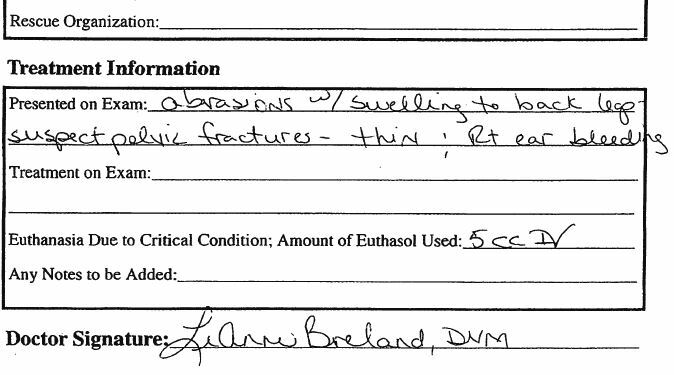 The other item I noticed in the veterinary evaluation report was the note from the vet: “suspect pelvic fractures”. The treatment line is blank. I interpret that to mean that the vet performed no x-rays, scans or tests of any kind on the dog to confirm the suspicion of pelvic fractures. This information seems to contradict the line from Mr. Andrews’ notes which indicated the vet “reported the dog as having several fractures and brakes (sic) in bones in back end of the dogs (sic) body”. 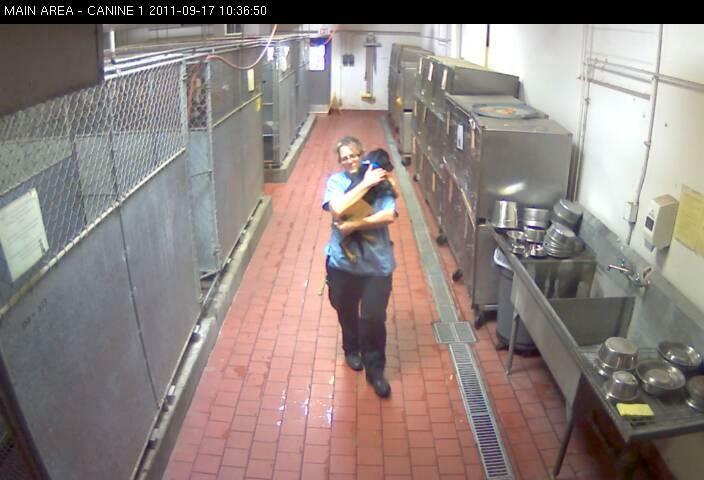 Was there anyone, at any point during the time MAS had possession of this dog, advocating for this dog’s right to live? It doesn’t appear that way to me. Of additional concern is the fact that this dog may have had an owner who would have advocated for the his right to live but there are no indications that any attempt was made to reach this owner. Had the dog’s info not been briefly posted on PetHarbor, no one outside MAS would ever have known what happened to him in the pound’s care. In many ways, this story is a direct contrast to the story of Harper. In Harper’s case, one person cared enough to advocate for the pup’s right to live, took action and the compassion snowballed from there, resulting in a life saved. In the case of dog #A232344 at MAS, no one cared enough to advocate for the dog’s right to live and ultimately he was killed based on an unconfirmed suspicion of injuries which may have been treatable. 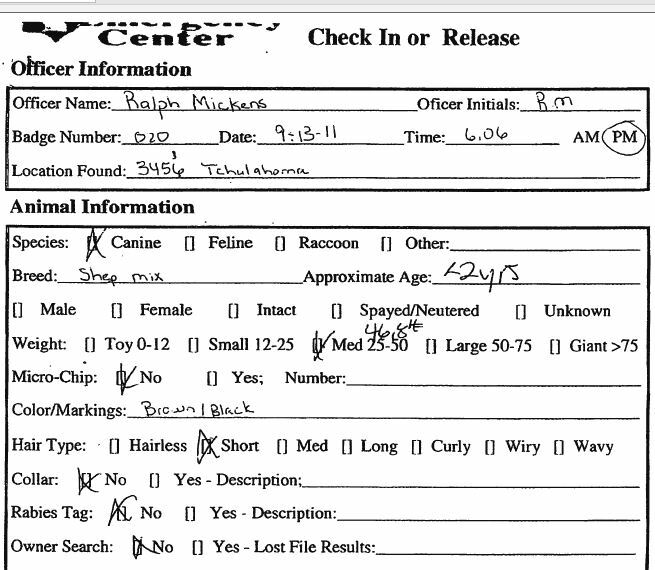 Further, the records do not show any attempt to find the owner who presumably would have served as this dog’s advocate. Dog #A232344 was put on a chokepole, transported around Memphis, killed based upon a suspicion, and quickly deleted from the PetHarbor site. How many more pets must suffer and die at MAS before the calls for reform outnumber the vigorous defenders of the status quo? 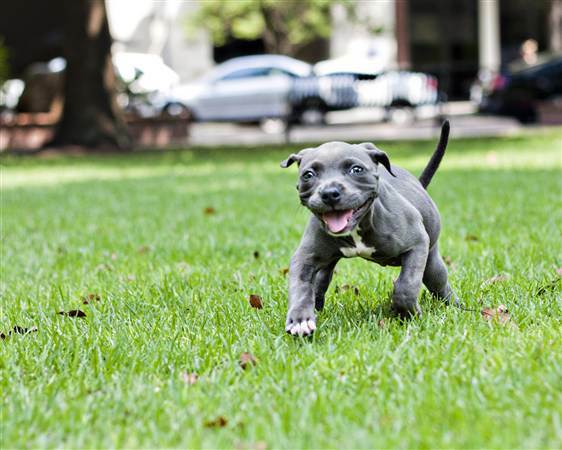 A man at a chain store parking lot was selling eight-week-old Pitbull puppies for $50 each. A woman approached him and asked about the moving garbage bag he was holding. 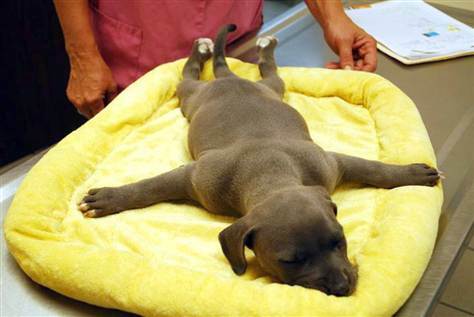 He tried to blow her off but she pressed the issue and he eventually gave her the swimmer puppy that was in the bag. 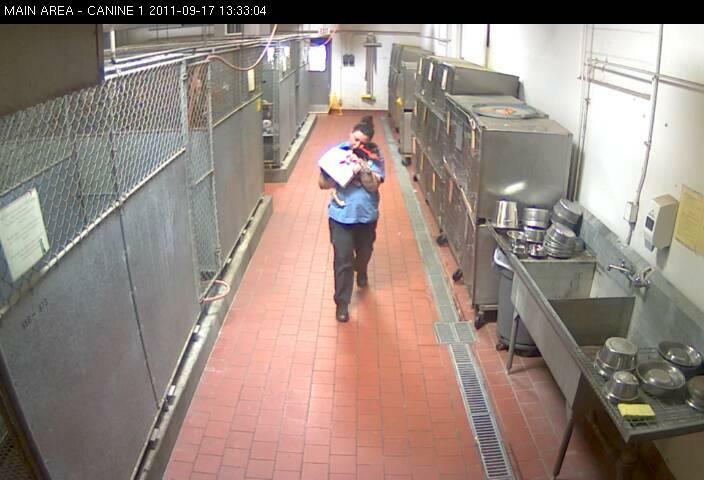 The Good Samaritan took the puppy to the local shelter where staff determined the puppy should be killed. Erica Daniel, a foster home provider who was at the shelter at the time the puppy arrived, asked if she could take her home and give her just 24 more hours of life. Ms. Daniel named the puppy Harper. 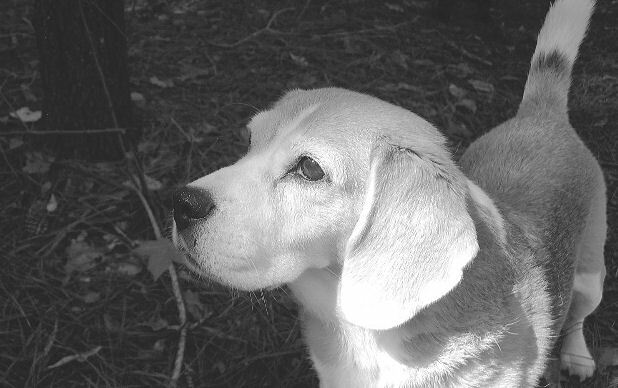 Harper at the time of her rescue. Despite that, Daniel kept massaging Harper’s tight muscles, hoping to alleviate at least some of her stiffness and pain. Within just a few hours, Harper started lifting her head and looking around. Her front legs became more limber as well, so much so that she tried using them to walk and pull herself around. And, as it turned out, the rumors of Harper’s demise were greatly exaggerated. Her organs were functioning just fine, and she had no heart murmur or serious brain abnormalities. The medical conditions she did have required treatment — but nothing that warranted putting her to sleep. Whoa again. A canine hydrotherapy clinic heard about Harper and offered free swimming and massage therapy. The pup responded very well and soon developed the ability to walk. Harper is now 11 weeks old and enjoying being alive. Harper's face says it all. Thank you to the kind-hearted woman who cared enough to rescue Harper from the trash bag in the store parking lot. Thank you to Ms. Daniel who didn’t give up hope, even when the shelter staff wanted to kill Harper. Thank you to the veterinarian who, despite misgivings about a positive prognosis, conducted the necessary tests to determine if those fears were founded in factual evidence in Harper’s case. Thank you to the canine hydrotherapy business for donating services to help Harper thrive. Thank you to everyone who has donated money for Harper’s medical bills and to Ms. Daniel’s organization, Dolly’s Foundation, which rescues bully breeds in need. The irresponsible public strikes again. Tell what you knew and when you knew it about the phone hacking thing. Or say other stuff. 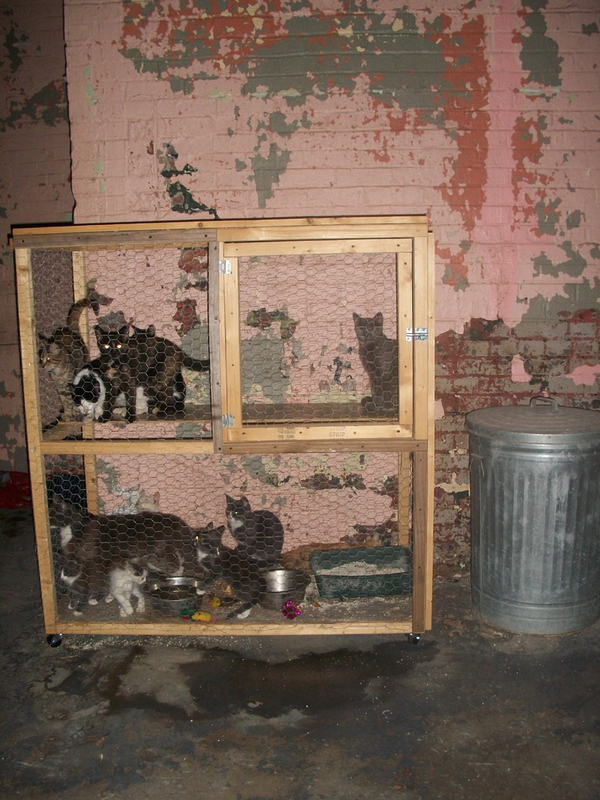 Failure #2: No appeals were made to the public for help in saving the pets. A group of local volunteers were able to get 165 pets to safety with very little notice. 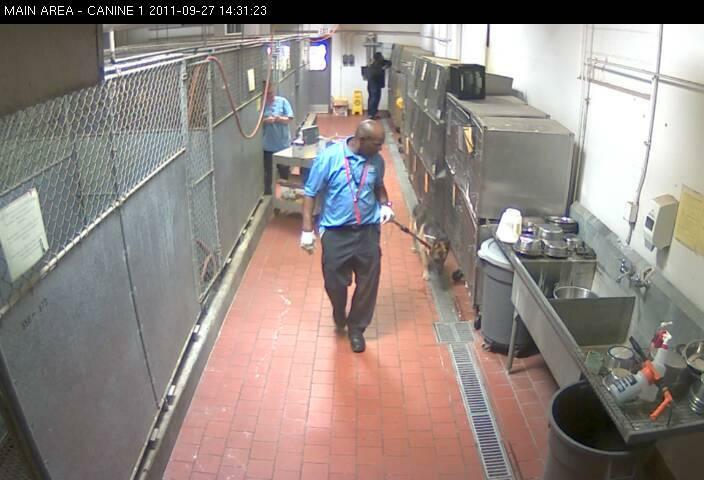 We also had a staff member who left and that was the person responsible for ordering the medicine that they use to euthanize the animals. We had to wait for another staff member to come back from vacation before we could resume euthanizations. Once the locals get done not slamming anybody and blaming the public and feeling sorry for themselves because killing is hard, maybe we could get somebody (anybody?) there to step up and demand reform. If not, I suppose they will simply carry on in their failing ways, in violation of the law and against all ethical obligations to stop the killing. What is happening in the effort to reform the Memphis pound? As far as I know, nothing. While I am hopeful that there is in fact meaningful work being done of which I am unaware, it pains me to know that may not be the case. That is not to say that there is no one doing anything at all. 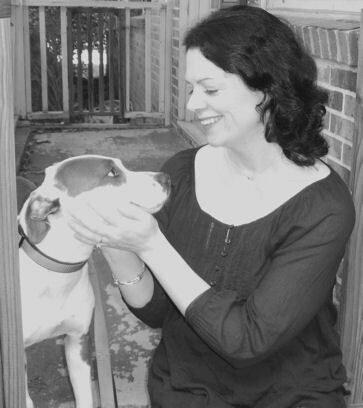 Indeed there are kind-hearted people working to save what few pets they can from MAS and others, such as those who attended the recent advisory board meeting, who are trying to give voice to the homeless pets in Memphis. All of these efforts are valuable and I am very grateful for them. But they are not change. They are status quo. Like so many other communities, Memphis is spinning its wheels in the Save a Few, Kill the Rest, Blame the Public ditch. 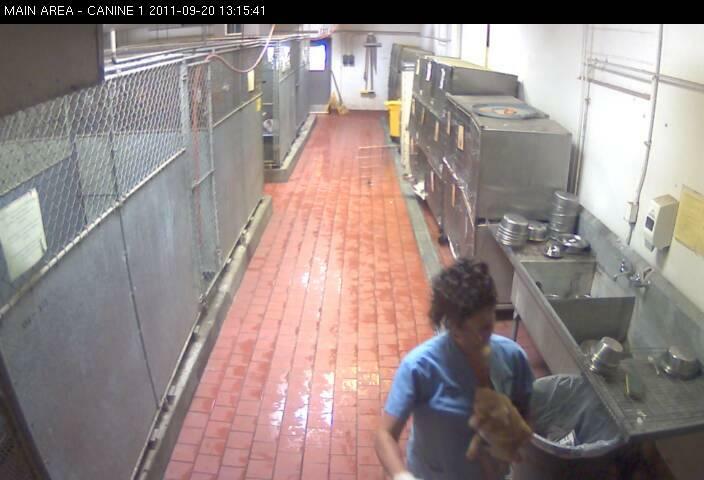 The city leaders who either sit idly by or actively defend the pound’s regressive and barbaric practices are enablers. Concerned citizens who accept excuses such as, “We’re trying but we just can’t do it” are enablers. This is a very comfortable position for MAS to be in – surrounded by enablers and easily resisting change. Human nature tends toward comfortable positions. 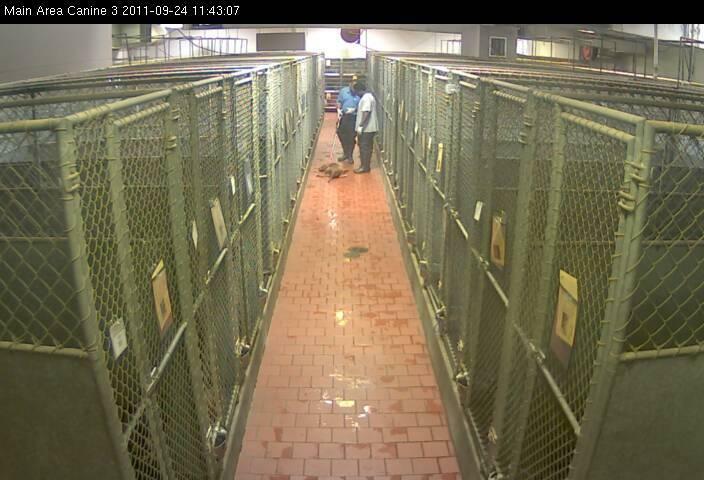 But unlike most other pet killing facilities, MAS has a vacancy in the director position. Historically, we know that this is the moment that real change can occur. Because leadership is everything. When Washoe Co brought in Bonney Brown, the killing began to end. When Tompkins Co brought in Nathan Winograd, the killing began to end. When Austin brought in Dr. Ellen Jefferson, the killing began to end. Is there any reason Memphis couldn’t be added to this list? No, there isn’t. But if Memphis isn’t added to this list, it will be because compassionate locals did not step up and demand it. And that would be a tragedy. Will anyone in Memphis stand up and take the lead on engaging the mayor in a political campaign to reform MAS? We’ve already established there would be lots of support locally and nationwide for this effort but we still lack the person willing to do it. Will anyone step forward and make their voice heard in the hiring of a compassionate director at MAS who is committed to bringing the killing to an end? The time is now. This is a chance to effect meaningful change but without leadership, the opportunity will be squandered and there will likely be another sorry excuse installed as director. From there, it will be Save a Few, Kill the Rest, Blame the Public. The enablers can stay in their positions of comfort and the pets will continue to suffer and die as a result. Memphis needs one person willing to lead a campaign for reform and one director committed to saving lives. With that, the whole nightmare ends. I know you are out there. The only thing I don’t know is, what are you waiting for? Trish from the Scotland Co HS in NC sent me a number of photos she took at the Marlboro Co facility in SC this weekend. I am hoping to receive a response from the pound and will update this post when I do. Trish says the cats are kept in 3 enclosures (two appear to be wood and wire, one appears to be stainless steel) in complete darkness. 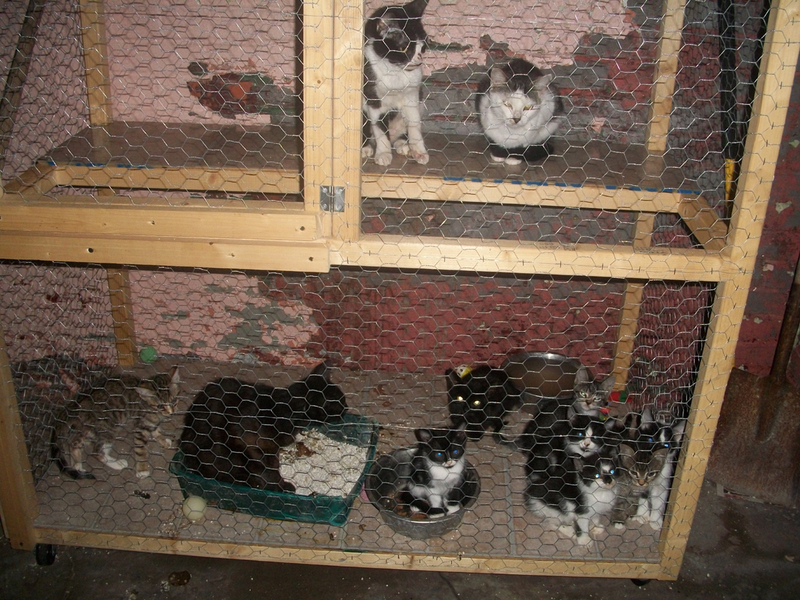 Inside the cat room at the Marlboro Co pound. 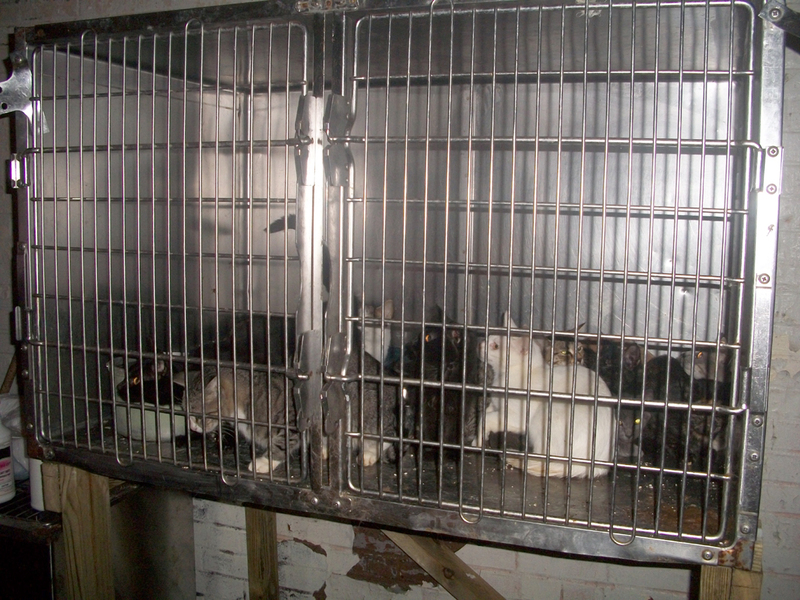 Cats at Marlboro Co pound. 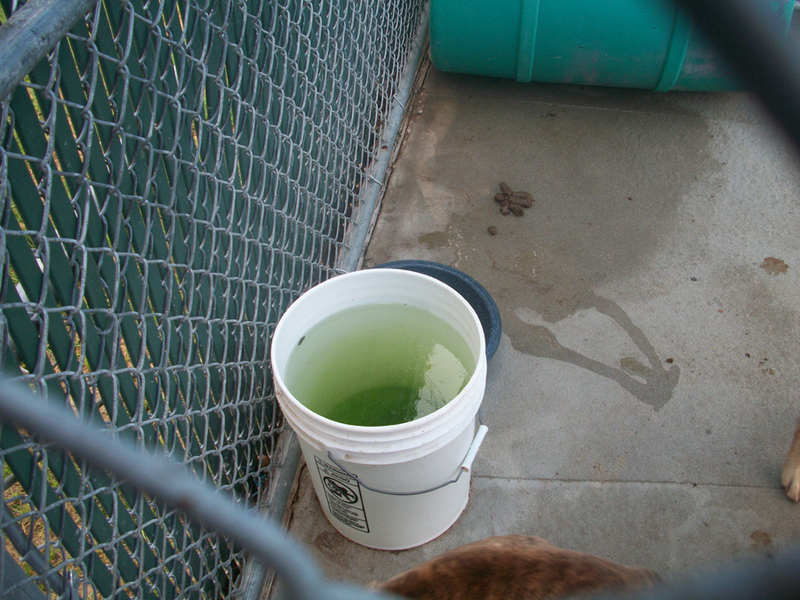 This is a shot of the water the dogs have to drink. 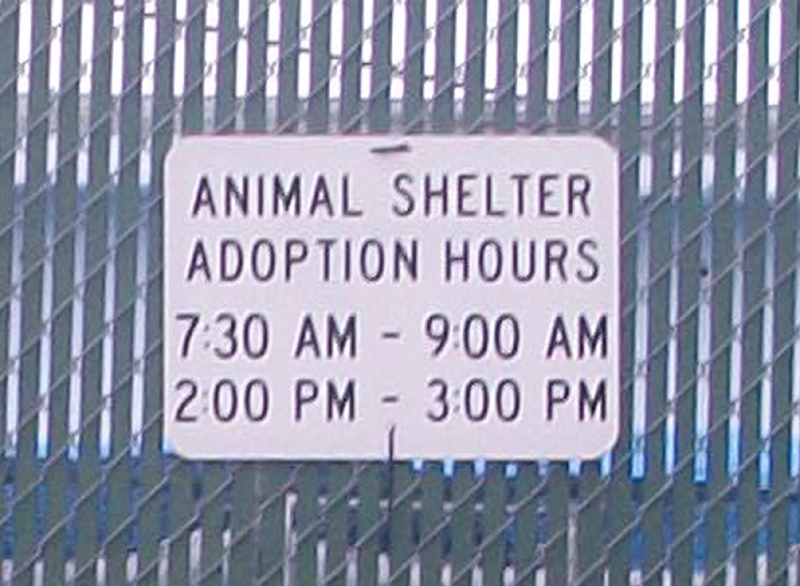 Sign at the Marlboro Co pound. I’m working to get additional details. Watch this space. Update, 9-20-11: I finally reached Cecil Kimrey, the Marlboro Co administrator and asked him about the conditions at the pound. He declined to comment but then added, “The Humane Society [of Marlboro Co] visits regularly.” I asked if he could refer me to anyone in the county who could comment on the pound but he said no. I also left a third message at the pound. I called between 2 and 3pm since that’s when they are open for adoptions but still got the machine. Hopefully they were busy adopting out pets. This video purports to show footage of puppies being kept in a kennel which appears to be flooded with filthy water at the Marlboro Co Animal Shelter in SC. I have reached out to the shelter, as well as a couple of other groups for comment but none of my messages received immediate replies. I was going to wait and see if any replies came in tomorrow (which is more likely than receiving a reply on a Sunday) but decided to go ahead and post as this appears to be an urgent neglect situation. I will post any responses I receive and in the meantime, if anyone has any additional information, please share. The scared puppy standing in the corner just about broke my heart. I’d like to get these pups some help, if possible. Will keep you all posted as to any new information.